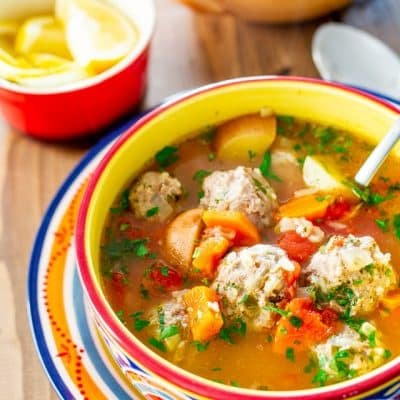 Albondigas soup is a traditional Mexican Soup and albondigas simply means meatballs. In Mexico albondigas are usually served in a light broth with all sort of vegetables. 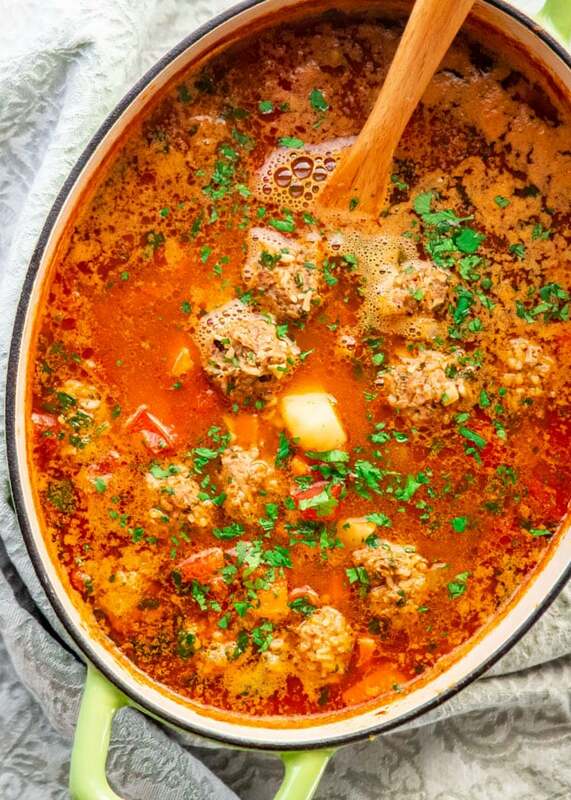 Meatball soup is a true comfort food, whether it’s my old time favorite Romanian meatball soup or Italian meatball soup. I am, however, very fond of this Mexican style meatball soup. It’s quite light but very hearty and you can load it with vegetables. I ended up only using carrots and potatoes because that’s all I happened to have in the fridge, but you can use green beans, zucchini, yellow squash or celery. The beauty of this soup is also how simple it is. But I love all the different herbs in this soup. I finally got a chance to use quite a few of the different herbs hubs is trying to grow. Fresh mint, oregano, parsley and cilantro. I used them all. And what a great aroma and flavor it gives to the soup. There’s nothing like fresh herbs. These fragrant herbs are in the meatballs too, so as you bite into each albondiga you will get all these beautiful flavors. 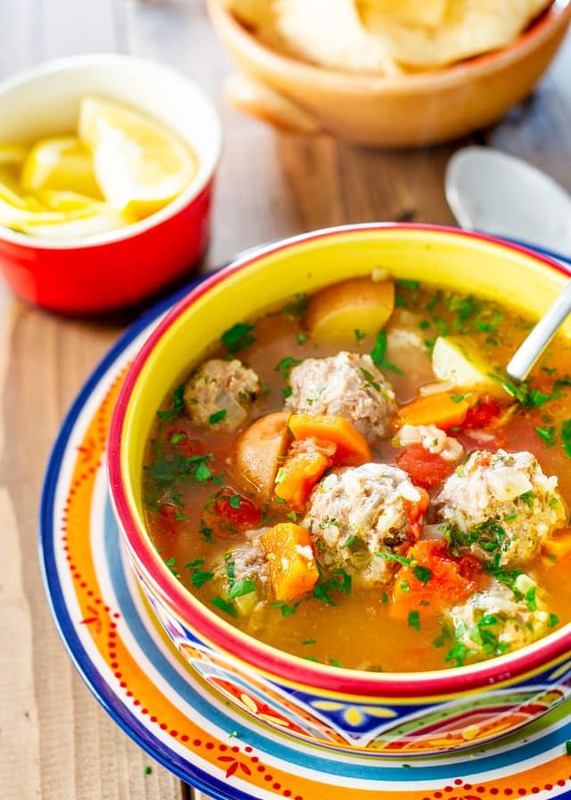 So next time you’re in the mood for a soup, and you really want something comforting, give this albondigas soup a try. It’s delicious and it’s hearty. Originally published August 14, 2014. Loved this! 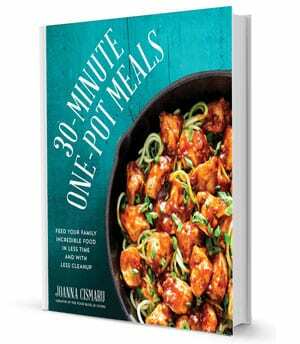 SO much easier than other recipes. I omitted the mint and still fantastic!!!! Glad you liked it, Juliann! Love it!!! Hope you’re enjoying them!